Could a failed Keystone XL amendment upend the Paris climate talks? Supporters of an international climate accord fear that a failed Senate amendment could come back to haunt the Obama administration as it tries to negotiate a global deal for Paris. The measure, rejected as part of the Keystone XL pipeline debate last month, was primarily focused on invalidating an agreement between the United States and China to each curb carbon dioxide emissions. Buried at the end was a line barring the administration from entering any future deal imposing "disparate greenhouse gas commitments" for the United States and other countries. It's a tricky word, disparate, and even the authors are evasive about how they want to interpret it. Taken at its most literal, though, it means Obama's negotiators could not sign off on a deal unless other major emitters -- or maybe even all countries -- cut carbon at the same absolute levels as America. At minimum, analysts on both sides of the aisle say, it is a stark departure from a congressional edict that has guided the U.S. approach to international climate change talks since 1998. Advocates of reaching a global climate agreement in Paris this December call the amendment by Sens. Roy Blunt (R-Mo.) and James Inhofe (R-Okla.) an attempt to upend the U.N.-led talks. Many Republicans readily agree. All said they expect the effort to rear its head again soon, and that could pose awkward problems for the United States. "It wasn't like there were high fives" when the vote failed, one Obama administration official told ClimateWire. "It was more like, 'Uh oh, when is this coming back?'" The last time Congress scuttled White House efforts to enact a global climate change treaty, the shock waves reverberated for years. Written in response to the Kyoto Protocol, the 1997 Byrd-Hagel resolution -- named for deceased West Virginia Democrat Robert Byrd and then-freshman Nebraska Republican Sen. Chuck Hagel of Nebraska -- is considered the definitive U.S. guide to climate deals. 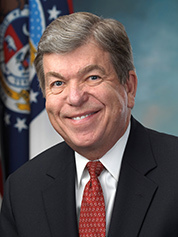 Sen. Roy Blunt (R-Mo.). Photo courtesy of Wikipedia. Approved 95-0, it declared that America should not sign any agreement that demands emissions cuts from only industrialized nations, as Kyoto did. Specifically, it said the United States may only enter a deal that "also mandates new specific scheduled commitments to limit or reduce greenhouse gas emissions for Developing Country Parties within the same compliance period." That edict has been a guiding star for Obama's climate negotiating team. And to the frustration yet growing acceptance of the international community, environmental leaders say, the administration is poised to successfully impose Byrd-Hagel on the rest of the world. If an agreement comes to pass in Paris, it will for the first time include "specific scheduled commitments" from all nations, and all major emitters will be held to the same legal standards for curbing carbon. That is, unless a new congressional mandate takes its place. "For almost 20 years now, the marker for the United States has been reflected in the Byrd-Hagel resolution. Countries like China, India, Mexico, South Korea need to A, do significant work to reduce emissions, and B, do it under the same legal basis as the U.S.," said Jake Schmidt, director of international programs at the Natural Resources Defense Council. "What the grand irony is in all of this is, that's actually what the Paris agreement is going to do," Schmidt said. "The ball has been moved by the Republicans." It was the U.S.-China climate agreement that got that ball moving. Ever since the November morning in Beijing when President Obama and Chinese President Xi Jinping each announced new emissions targets, Republicans have attacked it as a sucker's deal. "Are you operating under some kind of a delusion that somehow China is going to change their behavior?" Inhofe asked Janet McCabe, acting administrator for U.S. EPA's Office of Air and Radiation, at a recent hearing. Obama promised that the United States would cut emissions 26 to 28 percent below 2005 levels by 2025. China, Xi said, will peak emissions by 2030 and ramp up non-fossil-fuel energy generation to 20 percent. The administration and most energy analysts say China's effort is ambitious. In order to meet its goal, China will have to peak coal use soon -- an effort already underway -- and add as much as 1,000 gigawatts of wind, solar, nuclear and other zero-emissions generation by 2030. That, according to the White House, is more than all the coal-fired power plants currently existing in China and close to the total electricity generation capacity of the United States. But Republicans and industry leaders say they are far from convinced. The agreement, they warn, is the beginning of a global deal that will force the United States to do more than other countries and hurt the economy. "It certainly doesn't appear as if the largest-emitting countries are prepared to sign up to a program of the likes that we are embarking on here," said Luke Popovich, spokesman for the National Mining Association. Said Sen. Shelley Moore Capito (R-W.Va.), "I don't understand how you can have an agreement but [one party] does not have to do anything for 15 years." Shortly after the China deal was announced, Blunt and Inhofe drew up a resolution. Weeks later, it became an amendment to the Keystone XL pipeline bill. The measure failed to meet a 60-vote threshold and was rejected 51-46. But Republicans point out that it still won favor with a majority of the Senate. Yet when asked to define what they meant by trying to ban "disparate" targets for the United States, Inhofe and several of the 51 lawmakers who voted for it offered ambiguous definitions. "Before we take a step forward, everybody else has to take a meaningful step forward and show that there really is a global context," Capito said. Asked if she felt such a context currently exists, Capito rolled her eyes. "No," she said. "No." Sen. Lisa Murkowski (R-Alaska) said she believed the amendment was "a clear statement that if the U.S. deals with the issue of climate, that there is a recognition that other nations not be given a pass." Neither they nor Inhofe, when questioned, said they thought China, India or other countries should cut absolute emissions at the same levels as the United States. To the contrary, they argued that carbon cuts are crippling America's economy and are fighting U.S. EPA efforts to regulate power plant emissions under the Clean Air Act. Frank Maisano, an energy specialist with the law firm Bracewell & Giuliani who has been critical of U.N. climate agreement efforts, said the Blunt-Inhofe amendment was an attempt to "recreate and update" Byrd-Hagel. But, he said, new definitions are unnecessary. "The Senate went on record a long time ago establishing a record of what would be an acceptable treaty," he said. "I think [Republicans] are going to continue to talk about the concepts that were outlined in Byrd-Hagel and underscore the ways that the China deal and the India discussions don't really fit with that mold. And they don't." Supporters of a U.N. agreement, meanwhile, say insisting against disparate targets shows that Republicans just don't want to address global warming. "From a legal perspective, it's dubious to me what exactly that puts on the Obama administration. But politically, it's clear. They don't want to see an agreement of any sort come out of Paris," said Roger Ballentine, president of Green Strategies Inc., who served as chairman of the White House task force on climate under President Clinton. "To me, it's a huge shift to the right, not just from what Byrd-Hagel had said. Byrd-Hagel still contemplated that different countries could take on different levels of action based on their level of capability and contribution to the problem," said Dirk Forrister, president of the International Emissions Trading Association and also a former Clinton-era climate task force chairman. On the international scene, meanwhile, many nations have scoffed at the U.S. target and argue that the world's richest and longest-emitting nation should do even more. Forrister said that if the United States were bound by a mandate not to accept disparate cuts, it would be a "poison pill" for the Paris talks. "If the U.S. actually had to do the exact same thing as the developing world ... it would be a huge obstacle. That's never been the United States' policy. It's always been about countries doing what they were reasonably capable of doing," he said. Obama administration sources said they are bracing for Blunt-Inhofe to come back. Democrats in Congress said they have no doubt it will. "I think there is going to be a consistent effort to undermine the rulemaking process and undermine the president's ability to negotiate [in Paris]," said Sen. Ed Markey (D-Mass.). A Senate GOP aide told ClimateWire that the Republican conference is still "working on our overall strategy." Asked if the lawmakers view the Blunt-Inhofe measure as the new generation of Byrd-Hagel, the aide said, "It's been done before, and people will talk about doing it again." Whether a renewed Blunt-Inhofe resolution could win the kind of support that Byrd-Hagel did remains unclear. Analysts say the fact that the first attempt won away only one Democrat, Sen. Joe Manchin of West Virginia, does not bode well for a new, sweeping Senate mandate. Inhofe, though, said that as long as the Obama administration continues to press for a Paris agreement, he will keep opposing it. "I think the ball is in their court. Clearly, they want to pass something totally indefensible," he said. "We'll fight it."